The antivaccination cult really despises Bill Gates’ vaccinations in Africa. Not that he actually gives the vaccines, his foundation supports vaccinating kids in Africa, so that they have a better chance to survive. One of the world’s leading sponsors of vaccine research and bringing healthcare (including vaccinations) to underdeveloped countries is the Bill & Melinda Gates Foundation, located in Seattle, Washington. There is nothing more admirable and moral than a person who has built incredible wealth, and then decides to give it back to the world in a way that cannot be measure monetarily. Bill Gates’ foundation is working to eradicate polio and HIV in countries where they are the some of the leading causes of death. Who are the most annoying antivaccination shills? Please choose your favorite shill. Or not. If you have remarks, comments or complaints, just put them in the comments at the bottom. If I missed a category, please tell me that, I’ll try to remember it for future polls. 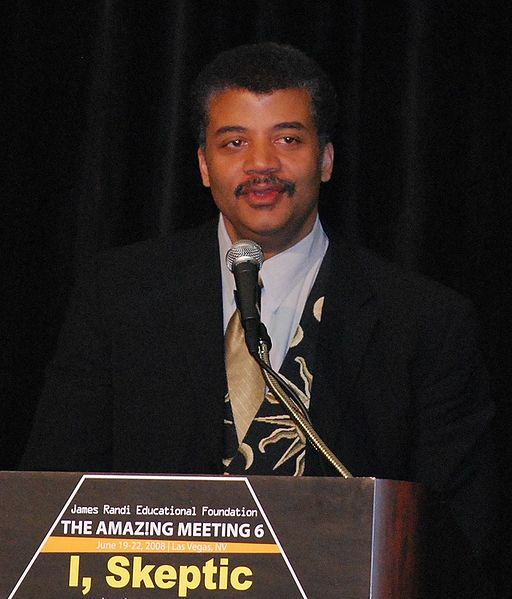 Neil deGrasse Tyson at The Amazing Meeting 6, 2008. Wikipedia Commons license. The lunatic Mike Adams, self-styled Health Ranger, pusher of pseudoscience, and publisher of the ignorant self-congratulatory, pseudoscientific website, Natural News, has issued an insane “challenge” to Neil DeGrasse Tyson, eminent astrophysicist, real scientist, and inheritor of Carl Sagan’s common-man touch about the wonders of science. What is this challenge? Well, Adams claims that since Tyson, who stated, in the new series Cosmos, that “follow the evidence wherever it leads, and question everything,” then because Adams only follows the evidence in his “cutting-edge science” publication, Natural News, then Tyson ought to accept all of the evidence uncovered about vaccines. What mercury used in medicine? Oh yeah, that old thiomersal in vaccines trope. The thiomersal which is an organo-mercury molecule that is quickly cleared from the body by the incredibly efficient kidneys. Or the thiomersal that was removed from vaccines despite no evidence that it did anything to anyone getting an immunization. Even though Tyson is an astrophysicist, he really does follow the evidence. And believe it or not, Neil DeGrasse Tyson has said something about vaccines. He accepts that they work. Getting over the laughable claim that Mike Adams thinks he follows any evidence, unless by evidence we mean pseudoscience that supports his ignorant beliefs about medicine, his challenge to Tyson is just plain ridiculous. Tyson, like any good scientists, accepts vaccines as safe and effective.